Mexico City has made significant improvements in air quality over the last 30 years but continued gains are proving to be difficult in the megacity. Despite reductions in the emissions of air pollution and its precursors, extreme pollution episodes continue to occur due to the city’s meteorological and geographic conditions — making the growing air quality expectations of the metro’s 20 million plus residents especially challenging to meet. 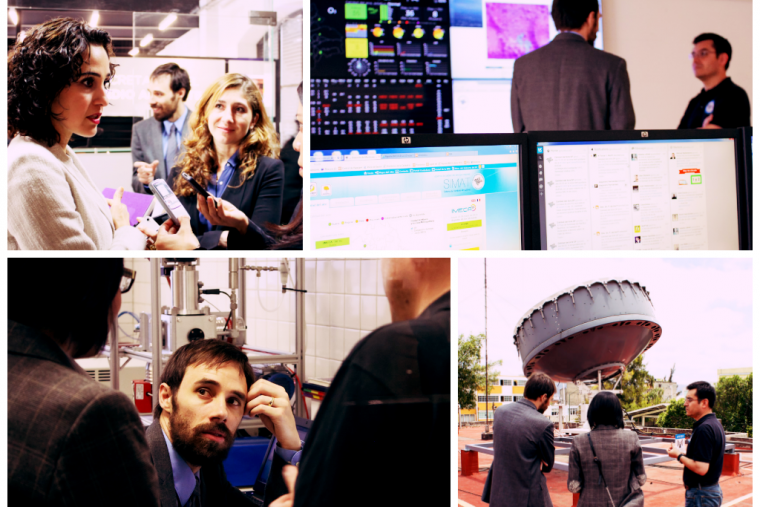 Since 2014, Professor Kevin Cromar, Director of the Air Quality program at the Marron Institute, has been working with Secretary Tanya Müller and her team at Mexico City’s Ministry of Environment (SEDEMA), supporting their ongoing efforts to improve air quality and reduce the health impacts from air pollution. The collaboration has focused on closing two communications gaps in the city’s approach to air quality: the gap between the technical and policy staff within SEDEMA and the gap between the reporting of information about the city’s air quality and the use of that information by city residents in day-to-day decisions that affect their health. Dr. Kevin Cromar talks with SEDEMA Secretary Tanya Müller, who Marron had the pleasure of hosting twice in New York City. SEDEMA’s team of scientists, previously led by Director of Atmospheric Monitoring Armando Retama, has tremendous technical capacity for monitoring and analyzing information about Mexico City’s air quality. The challenge for SEDEMA has been making technical information accessible to the ministry staff members who are responsible for setting policy, occasionally leading to policy missteps. Cromar’s team worked with SEDEMA to bridge the gap. As a result of this work, SEDEMA established a management role that facilitates regular communication between the science and policy teams. One immediate benefit of the improved coordination was a decision to scrap a costly expansion of the city’s air quality monitoring network — an expansion that would have done little to further inform air quality management decisions. 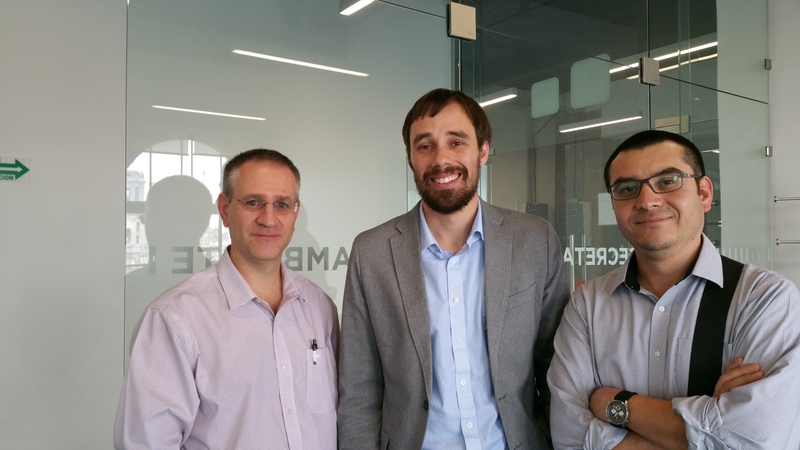 Dr. Cromar with members of SEDEMA's science team: Dr. Antonio Mediavilla and Armando Retama, the previous Director of Atmospheric Monitoring. SEDEMA also enlisted Cromar's team in efforts to improve the communication of the health risks associated with air pollution. The clear communication of air pollution risks is an important part of mitigating the adverse health impacts of poor air quality. If people are not aware of pollution-related risks, they cannot change their behavior in ways that reduce their personal exposure. To improve communication, Cromar’s team recommended that SEDEMA staff receive additional training in atmospheric modeling in order to forecast future air pollution concentrations. The Marron Institute provided the financial support to send a SEDEMA analyst to the Community Modeling and Analysis System (CMAS) training in North Carolina to build this technical capacity. As a result of this support and training, and through an on-going collaboration with researchers from Barcelona, next day pollution forecasts are now publicly available in Mexico City — allowing residents to plan ahead. Public outreach and scientific surveys coordinated by Cromar’s graduate students also suggested that, while residents were generally aware of the city’s air quality index, they were not necessarily using the index to change their day-to-day behavior in ways that could protect their health. This is particularly true of residents who are susceptible to air pollution due to existing respiratory disease and therefore have the most to gain from reducing their pollution exposure. Tim Borbet (top left), one of Cromar's graduate research assistants, presents the results of the city's air quality index survey. In an effort to provide residents with more actionable information on air quality, SEDEMA enlisted Cromar’s team to develop a health-based air quality index — an index that is based on local associations between pollution and respiratory health in Mexico City and designed to be easier for residents to understand. In coordination with SEDEMA and the Ministry of Health in Mexico City, Cromar’s team was the first to receive daily, as opposed to weekly, health statistics. This enabled Cromar to establish city-specific associations of ambient air pollutants and respiratory morbidity in Mexico City. Because the impacts of air pollution affect children and adults differently, the new index was designed and validated to effectively represent multi-day respiratory morbidity risks among both children and adults. 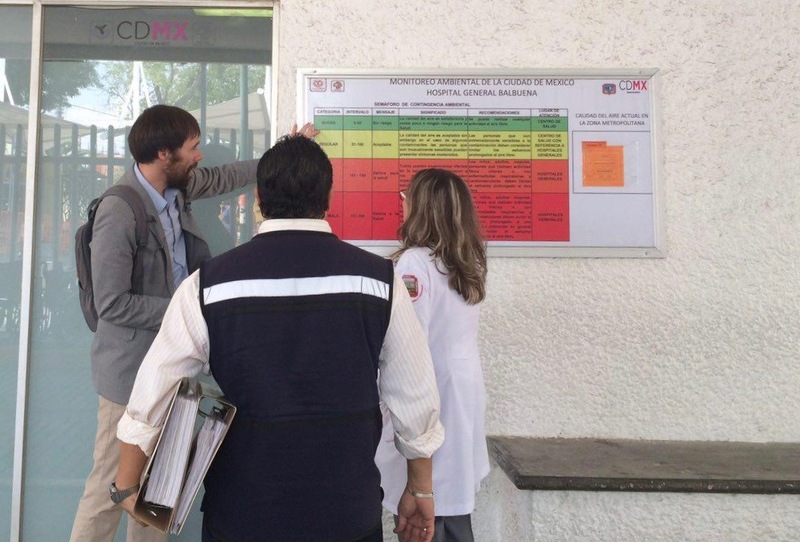 Dr. Cromar reviews Mexico City's health-based air quality index with local hospital staff. Based on recommendations by Cromar's team, and through discussions with local medical practitioners and hospital administrators, SEDEMA is now piloting the dissemination of the new index through primary care doctors and their patients. As a participant in the working group for the Air Quality Health Index in Canada, Cromar was able to enlist colleagues from Health Canada to share their materials and prior experience from rolling out a health-based air quality index. With ongoing assistance from their Canadian colleagues, SEDEMA is now developing materials to train medical practitioners on how to best communicate information about the new index. A broader roll out of the health-based air quality index is anticipated toward the end of 2018 and Cromar's team will assist in the evaluation of its effectiveness. Cromar and the Marron Institute are grateful to have an ongoing role in Mexico City’s efforts to curb air pollution and reduce its health impacts on the metro’s 20 million plus residents. We applaud the sustained efforts of Secretary Müller and her team at SEDEMA over the past four years and look forward to continued collaboration with the new administration starting in 2019. Photos from Dr. Cromar's initial visit to Mexico City and SEDEMA with former Marron Research Scholar Alejandra Rangel-Smith. A special thanks to former Marron Research Scholar Alejandra Rangel-Smith for the instrumental role that she played in facilitating collaboration between SEDEMA and the Air Quality program. Thanks as well to the NYU research scholars and graduate students who supported Cromar in his work with Mexico City: Tim Borbet, Andre Machado, Lars Perlmutt, Laura Gladson, and Marya Ghazipura. Finally, the Marron Institute is tremendously grateful for the opportunity to work with SEDEMA in pursuit of health and air quality in one of the world's largest cities. In particular, the Institute would like to thank Secretary Tanya Müller and members (current and former) of her science team: Dr. Antonio Mediavilla, Armando Retama, and Monica Jaimes Palomera.